Luigia Zilli is a professional published visual artist with a long career in the fine arts. Born and raised in Italy she lives now in Canada, in a town called Oakville, not too far from Toronto. 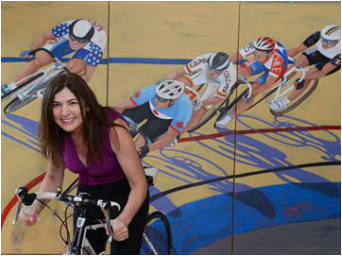 Her bicycle art became very popular since her first cycling painting in 2005, "Tour De France" which was featured at the first edition of the Giro di Burnaby, a professional cycling race that takes place in Burnaby BC, Canada. 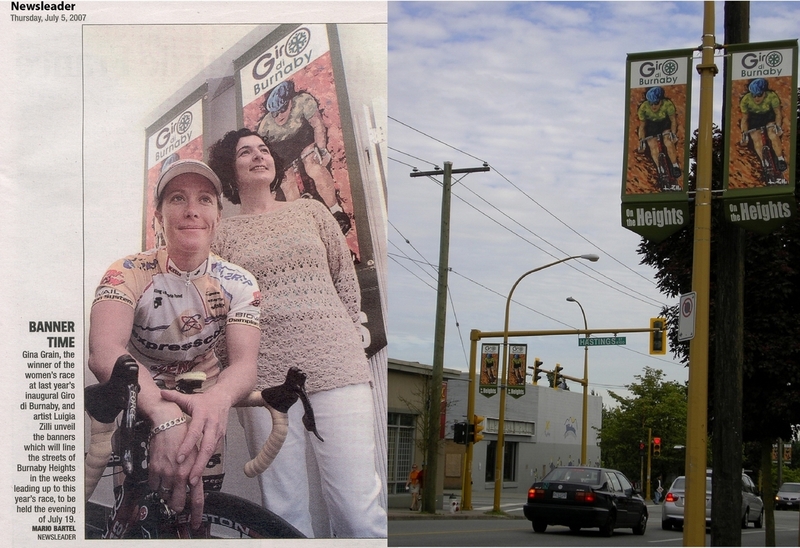 Also, "Rouler" is the painting which was printed on the 160 street banners that hang all around the race route. Afterward, cycling fans could see in person her works displayed in art exhibitions in Canada and Italy, and also online. Available for purchase in this site her original acrylic paintings, limited edition giclee prints on canvas, giclee prints on artist paper, posters and greeting cards. Commission works also welcome, for private, corporate, race organizers and teams. Bicycles and cyclists portraits are great gifts for cycling enthusiasts. 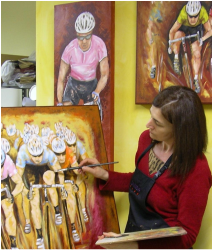 "I paint bicycles because they are my passion since childhood, I have cycled and grown up in a family of cyclists and in a place where this sport is one of the most popular ever. The inspiration has a lot to do with my personal experience and being involved in activities where the bicycle it’s the protagonist. 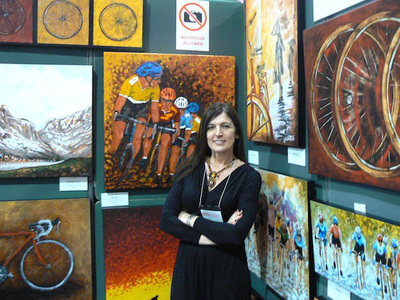 Since 2006 I had several shows in Italy and Canada where I exhibited my bicycle art that became very popular with collectors worldwide. I’m also very inspired by our everyday kind of bicycle: I grew up in a small town in Italy where it was the most common utilitarian way to move around for people of any age. I have wonderful childhood memories riding the bicycle with my friends, being able to go everywhere in a short time, it really gives you a great sense of freedom.The bicycle, in my opinion, it's a simple but very attractive machine, it has its own elegance and dynamism. It’s a great invention and I also consider it a symbol and a precious tool for living our future in a clean environment keeping ourselves healthy and happy". More info at Luigia's website (click here).